However, I'd like to accommodate changes in the data over time. For instance -- there are currently 5 levels of priority that can be reported in the database (i.e. Blocker, Critical, Major, Minor, Trivial) ---- but not all are used during every reporting period by the users (e.g. Critical, Major, Minor may be the only entries for a particular reporting period)..... it is very likely that users will include all (i.e. all 5) priorities in the future for a particular reporting period. Also --- it is likely that for the next reporting period the user's may only use 3 of the priority levels. My dilemma --- my current graph script only accommodates a fixed number of priorities ---- so if I build it to only handle 4 then I may be excluding data on the graph ---- I have tried to force it to always show 5 priorities but it seems to mess up the legend (wrong order of labels/colors)........ Is there a way to make it dynamic depending on the data values to be used in the 'overlay'? Good question. 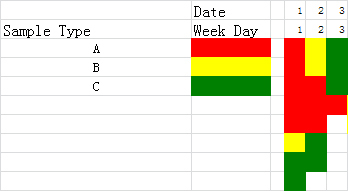 The only work-around I can think of is to add dummy rows to the data table representing all priority levels but with missing values for the other columns. 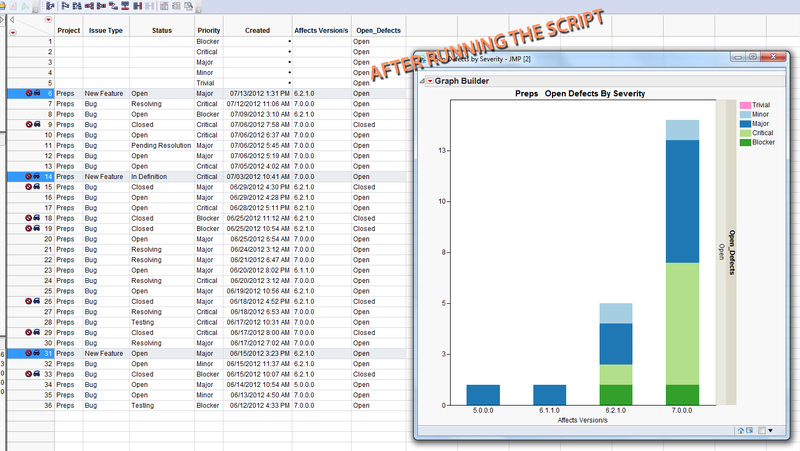 The remainder of the script filters out those rows because no other fields within the rows have data - so these new rows do not corrupt the graphs that are generated (i.e. showing the additional Priority data). Your table file and JSL help me understand your issue and final solution. Learn an important application case. Here i try to use a bar-like graph to show daily sampe loading type,sequence and numbers in our lab. Here you can find totally there are 21 types of sample to enter our lab to test. I try to track their arrival sequence every day. I use one color for one kind of sample. If there are the same successive samples reach, it will be a long bar with the same color. I have attached a graph produced by excel. Do you believe we can realized it via jmp JSL way? Stacked bars might work if you add a filler white category for the gaps. Another idea is the Heat Map element in Graph Builder. Pic attached. Are you can make a scatter plot and choose a filled rectangular marker for each point. thanks for your help.Your suggestion seems can not solve my problem. I try to better explain my need here again. As you can find the attached "lab sample entry" table, here i record all sample entry type, time and sequence. I try to get final grap output as attached "desired graph output". Color means diffrent sample type. Sequence of sample entry is quite important for us. The earliest entry will located in the first row of every day. The last entry will be located in the last row of every day. Every cell means a sample batch. I have tested using cell plot after transform the origial table to get a transform table. However as you can find in attached cell plot, i can not get desired color. JMP seems always start to color from the first type of product. This is not my desired way. I need fix color for every type of sample. Can you give me some suggestion? Thank you in adavance.